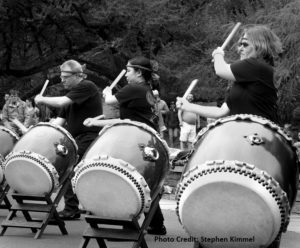 Learn how to play Japanese taiko drums from Philadelphia’s community taiko drumming group! Kyo Daiko’s Beginner Taiko Classes are open to adults of all ages, musical backgrounds and experience. In fact, no experience is necessary. 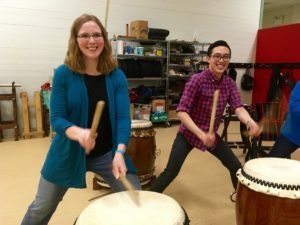 We will teach you everything from proper stance, how to hold the drum sticks, striking technique, and the history and traditions of taiko. Children 12 and over are also welcome with parental supervision. Students practicing on beta drums. The fee is $60 per four week session. Classes are 90 minutes, once a week on Thursday nights from 6:00 – 7:30 PM. New students can begin in any session and will renew per session. Each session focuses on one of four styles of taiko: beta, odaiko, shime and naname. New students can start with any style. In beta style, the drumhead faces up to the drummer and is parallel to the ground. 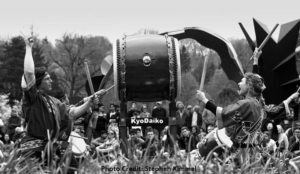 With the dramatic odaiko style, the drum is put up on a tall stand with the drumhead perpendicular to the ground. 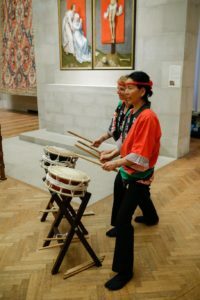 The small shime drum plays an important role as the timekeeper in a taiko ensemble, keeping the base beat, or what we call the “ji.” In the shime session, you will learn basic “ji” patterns. With naname style, the drum is set at a slant, which opens up lots of opportunity for beautiful choreography. The full schedule with list of styles is below. please contact Shofuso staff at japanesehouse@japanphilly.org. Two shime drums in action.